Are E-Cigs Healthier Than Cigarettes? Can E-Cigs Help Smokers To Quit? Does Hypnotherapy Help With Quitting Smoking? E-liquids are used in the electronic devices designed to be smoked instead of traditional cigarettes. E-cigarettes are said to be better for air quality, they are not supposed to create harmful second hand smoke, and they will not burn you because they are not burning like a traditional cigarette is. Nicotine is included in most of the e-liquids available, but it is in varying strengths. You can buy e-liquid that does not contain any nicotine if you like the feeling of smoking but do not want the nicotine. A base liquid such as propylene glycol which is a compound that is organic in nature, and used as an additive to foods, and in many oral medications, glycerine is used in foods as a thickening agent and is found in many over the counter cough products, it is very sweet and many manufacturers do not use it because of its sweetness, or polyethylene glycol which is a common ingredient in many forms of toothpaste, and oral care products. There are a lot of different e-liquids on the market today. You can find them in almost any shop or store that sells tobacco products, and you can find them in online searches. There are a few things you should look for when you are buying these liquids. To avoid severe reactions, or even poisoning, you need to buy liquids that are made from the highest quality of ingredients. It is best if they are using pharmaceutical grade ingredients to mix the liquids. You want liquids that list the ingredients of the flavourings they have. 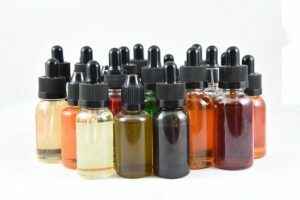 Some flavours are made from natural food source flavourings, but some are specifically designed to be added as flavour to e-liquids for vaping. You want to know what is in the flavours before you buy the liquid. Do you have to Refrigerate E-Liquids? You do not have to refrigerate your e-liquids. You do need to keep them in a cool dark place. Always check the packaging for Best Before dates. Can I make my own E-Liquid? A lot of people do mix their own e-liquids. You need to carefully measure everything that you put into the mixture. Never guess at an amount, and always wear protective gloves, and eye protection when you are making your own liquids. You can buy two separate flavours of e-liquid and combine them to create one unique flavour. You must be careful to buy two flavours of the same strength or the mix will likely not turn out as well as you’re hoping for. You can purchase a large bottle of e-liquid that is a high strength variety, and cut it with a base liquid to create a lower strength liquid. Many people do this because the large quantity of e-liquid can be made to go much farther if it is cut with a base liquid. This is a great idea for the budget conscious user. You should note that when you cut the liquid you are going to reduce the strength of it and you are going to reduce the flavour that it has, leaving you with a milder e-liquid. I suggest that when you are making a new mix you try mixing with a mixing base that has no nicotine. Once you have got the mixture amounts perfected to create the flavour that you want then you can mix a batch up using a base liquid that contains the nicotine. This will save you some money. Nicotine is bitter tasting so you will need to increase the amount of flavour you add to hide the bitter taste. The glycerine you buy that is formulated for e-liquid manufacturers is not as thick as the glycerine that can be purchased from a chemist. If you want to use the thicker glycerine it can be diluted using a clear alcohol like gin or vodka, or simple water. It is suggested that you add one drop of water, or thinner to every nine drops of glycerine. Do not make a mixture that contains more than twenty percent water. Keep a recipe book that notes how many drops of each flavouring you use when creating your liquids so you will be able to create an identical batch in the future. Write down your mistakes as well. Then in the future if you have the idea to try one of your mistakes again you will be able to see that you have already made that mistake once, and you will not waste ingredients trying it again. Use the same size dropper every time you mix. Droppers come in different sizes, and that could reflect on your liquid quality.